Is there really an Abeling Street? Yes! The real "Abeling Street" is located in Canajoharie, New York. Our web site is called "Abeling Street" because its where my ancestors immigrated to America and is also the location where I started my quest over 20 years ago to research my family history. The real "Abeling Street" was named after Charles and Sophia Abeling that emigrated from Germany to Canajoharie, New York around 1831. Many of the Abeling family members built homes along Maple Ave and Abeling Street. In fact, the home at the corner of Maple and Abeling St. still remains in the Abeling family today. The purpose of this website is to share the family history that Ive learned, educate family members about our relatives, preserve our family history for future generations and find other family members to exchange information. Charles Abeling and Sophia Scharff lived in Canajoharie, NY. Includes branches that moved to Vermont, Iowa, ,Illinois, and Georgia. Herman and Maria Abeling, living in New York City. Julius and Augusta Abeling, includes a branch from Otto Abeling who moved to Idaho, Washington, and Oregon. Brothers Henry and Frank Abeling, with descendents in Cincinnati area. John "Bernard" and Clemence Abeling, who lived in Ohio. Clemence moved to California. Augustus and Rose Abeling, originated from Germany, moved to Minnesota, with descendents in Washington and Oregon. Ernst and Anna Abeling,of St Charles, Missouri. Gerhard Abeling, originated from Germany, with descendents in Brazil. John Abeling who immigrated to Australia in 1952. Talmadge Edwards and Mary Sherman, who lived in Johnstown, NY 1790 to 1820. Samuel Liles, originally of Kentucky, then Iowa, with most descendents living in Montana. William Moore, with many descendents in Nebraska and Montana. Jacob & Eva Songer, originating from Virginia, with many descendents in Illinois, Missouri, and Iowa. Check out the lastest missing information that you might be able to help with. William J Abeling's Cigar store from 1830 to 1909. 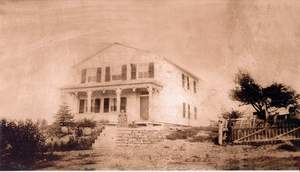 Fred and Frances Abeling's Hotel on Conklingville Lake . If you have any questions or comments about the information on this site, please contact us at street@abeling.org.. We look forward to hearing from you.